F.A. Wyatt and Co. Ltd./Peek Frean reception at the Shelbourne Hotel, Dublin. At the F.A. 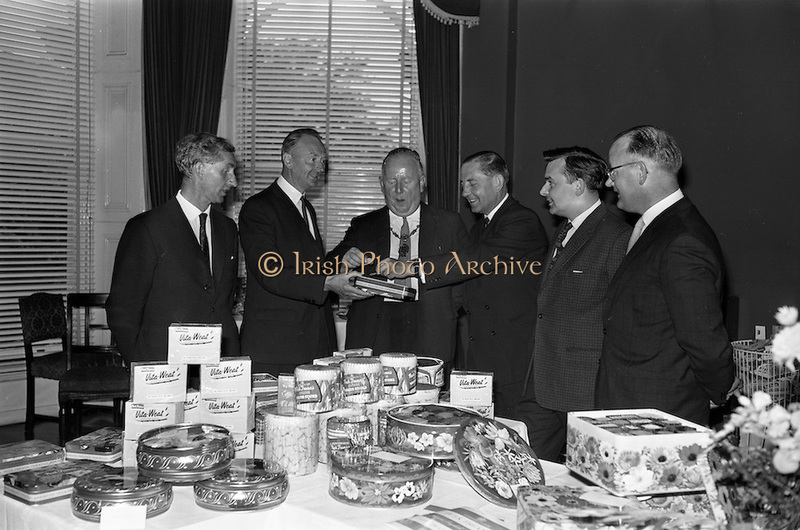 Wyatt presentation of the products of Peek Fream Biscuits were: Mr. Henry O'Neill, Managing Director, Punch and Co. Ltd., Cork; Mr. T.S. Maharry, Managing Director, F.A. Wyatt and Co. Ltd.; Alderman J.J. O'Keeffe T.D., Lord Mayor of Dublin; Mr. A.M.A. Battle, Export Sales Manager, Peek Fream and Co. Ltd.; Mr. Tony Corboy, Managing Director, Looney and Co., Limerick and Mr. Brian Carton, Director, Carton Brothers, Dublin.